A lot of people assume that I am critical of the charedi world due to bitterness about the ban on my books. I suppose it's a reasonable hypothesis, and I can't be objective about myself. However, to the best of my self-awareness, it's not the case. I have different reasons. As I have written on many occasions, most notably in my essay "In Defense Of My Opponents," I am extremely sympathetic to the ban on my books. Of course, I don't think that my books are actually heretical, and the ban was handled extraordinarily badly, causing me a great deal of pain. But I certainly agree that the rationalist approach is harmful for many people, and that the charedi leadership has the right, and perhaps even the duty, to attempt to keep it out of their community. To my mind, the problems with the charedi community are not its opposition to science and rationalism. Vastly more problematic are, for example, its approach to abuse, with Ami magazine's recent interview with Weberman's defense attorney (but not the attorney for the prosecution!) being the latest example. Another serious problem with the charedi world is its utter mishandling and abuse of the concept of rabbinic authority, with major decisions being made in a non-transparent way, by people who lack the proper knowledge, wisdom and input to make such decisions, and being manipulated all the way through by askanim. Still, to my mind, these problems, as grave as they are, do not fundamentally invalidate charedi society in its entirety. Every community has its problems. Chabad has its crazy messianism. Modern Orthodoxy fails to produce adequate teachers to perpetuate itself. Religious Zionism struggles with political extremism. The biggest problem with charedi society (certainly here in Israel; I'm not sure about the US), the one that makes it a failure, is something else: the charedi approach of mass, open-ended kollel, with the notion of work being, at best, a choice for second-class citizens, and at worst, something less preferable to collecting at people's doors. This goes hand-in-hand with educating one's children to follow the same path, and denying them the education and (more importantly) the inclination to do anything else. As I've written previously, this is completely untraditional, or, if you want to sound more frum, against the mesorah (see my post The Invention of Kollel, and my paper on The Economics of Torah Study.) It also goes against numerous statements in Chazal about the value of work, the problem of casting oneself upon the community for support, and the obligation to train one's children to be able to provide for themselves. It goes against the kesubah, in which a man accepts to “work for, esteem, feed and support” his wife. It goes against the very fundamental nature of human society, across all times and cultures. The problems that it causes are catastrophic, and extend far beyond the financial poverty of the people in kollel. Parents drive themselves into deep debt in order to marry off their children, which requires buying them apartments and supporting them for many years, even forever. Shidduchim are made and broken on the basis of money. An often unbearable strain is put on the wife, who is expect to not only give birth to, and raise, many children, but shoulder the burden of earning money (in contrast to the kesubah). The men themselves often feel unfulfilled and inadequate (which they are). And poverty itself is the cause of many problems with shalom bayis. And it's a problem that just gets worse and worse with each generation; for each child that goes a little "off" and attends one of the new charedi vocational training schools, there are five that don't. In Israel, the problem is compounded. Not only is there an entire community that simply shirks its responsibility in sharing the national burden of serving in the army, pretending (to itself as well as others) that learning in kollel is an adequate substitute. It also drains from the national economy instead of contributing to it (and I'm not just speaking about money - I am talking about not putting skilled people into the workforce). The result is a community that is fundamentally selfish - taking and not giving. I was gradually working along this line of thinking even before my books were banned. The ban just helped remove the emotional ties that hindered me from seeing the conclusion. If you had your druthers, to which schools would you recommend these lovely Anglo charedi-wannabe families send their kids? I have friends in Ramat Bet Shemesh, and I'd like to see they make wise decisions concerning their children's education. Having mostly Chassidic relatives in Israel only one I am aware of is in Kollel. The modern Kollel ideal is not a Chassidic one. It seems "Chareidi" when not used as an all encompassing umbrella term really means "Litvish." There are charedi grade schools in Israel, and even high schools, which offer a reasonable level of secular studies, even "bagrut" exams. The problem is 1) these schools (especially high schools) are in the minority, and 2) a very high percentage of those kids get fed straight into yeshiva gedolah, with no expectation of army service and/or higher education (but instead pressure against it). I suspect many Anglo families choose the charedi route because culturally they and their kids don't feel comfortable in the Dati Leumi world. There's a tangible cultural, philosophical, stylistic difference. If there were schools which "felt" more charedi but were army/education/work-oriented, and good schools (not just "nebach" my kid isn't cut out for Gemara schools), then I'm certain more Anglos (and others) would go that route. So one of the problems in this whole equation is lack of choice. From a purely secular economic view, bderech hateva, the system is not viable long term. If you are a true believer (or want to be) this doesn't bother you. Unfortunately in many individual cases the consequences become obvious too far down the line. As a society within a society, I don't like to think about the consequences-they are scaringly macro. Part of the problem with the system is that it's leading promoters, rabbis, roshei yeshivos, have little reason to think differently. They manage to set up shtellers for their sons and sons in law. They don't worry about the next generation's parnassah. I was just thinking yesterday why the dais at the Agudah convention is so paltry, there are maybe two recognizable faces and even they dont have a global following. Haredim may have respect for, lets say R Shmuel K. but nobody from Chaim Berlin is running to Pennsylvania to seek out his advice. In 50+ years of kollel in this country: more people learning Torah full time then perhaps any other time in recorded history and there are no "Gedolim" in the United States. People universally recognized for their greatness. R Aron Kotler's first generation of students aren't that either. How was R Aron, the Rav, even the Lubavitcher Rebbe different? The answer is they werent controlled by a system, stripped of their personality, interests, prevented from also pursuing non Torah literature. R Aron read Russian novels, wrote love letters, the latter showing how different his mentality was at age 19 from today's 19 year old kids in the Mir or Brisk or Chaim Berlin. The Rav attended University, the Chabad Rebbe audited classes in Berlin. The greatest of the past generation were individuals, people who developed at a time people could still legitimately not learn Torah and still be considered a good Jew. Kollel and the Hashkafa of Charedism is truly one of the worst things to befall the Jewish people in a long time. The only anomaly is R Moshe Feinstein who lived in a forest clearing deep in the Russian forests and so he did not have the option of going to college or perhps a Gymnasium. Still though I think my theory holds true and there was certainly an interdependent streak in the man, he studied in a shul, a totally different system than exists today. Over the years, I have come to see that the problems you mention are related to the same anti-rationalism which led to the ban on your books. One charedi Rosh Yeshiva I once knew constantly and explicity mocked common sense as concept, especially when ridiculing the parents who wanted their sons to return home some day to attend university. His outlook encapsulates the credo quia absurdum est ("I believe because it is absurd") which today constitutes the bedrock of charedi hashkafa, and which sits only too comfortably with anti-rationalist mysticism. The ban, anti-rationalism, and the financial catastrophe in the charedi world are all linked. Just yesterday, my wife was asking one of our daughters why a certain boy (very frum, who is learning and going to school to get pre-requs for medical school) is not being "red" to any girls from a certain Bais Yaakov our daughter attended. Our daughter answered that the obviously the girls are only looking for "learning boys" and this boy, who IS learning, just not forever, is not good enough. What a sorry state of affairs. "But I certainly agree that the rationalist approach is harmful for many people, and that the charedi leadership has the right, and perhaps even the duty, to attempt to keep it out of their community." Why is the truth good for you, but you're ok with leaders keeping other people in the dark? You didn't like being kept in the dark--that's why you changed. Why are you ok with people doing unto others what you didn't want for you? People can choose what community they want to be in. If they choose to be in the charedi community, then they are choosing to be kept in the dark. They know that. So the thousands of babies born to people who "choose" it don't have a choice in the matter? Why do you pretend every member of that society chooses or chose to be there? "People can choose what community they want to be in. " That shows a staggering lack of insight. Most people in the chareidi community were born into it, and every single aspect of chareidi community's strictures and mores are designed to make it as difficult as possible to leave. How can you say such a thing?? When we lived in Israel, well over 20 years ago, a good school that both my son and daughter went to was Chorev in Yerushelayim. I don't know what the school is like today but my kids did get a decent education there. I will also not forget what my younger son got from being in cheder: Hepatitis (wonderful cleanliness). This is an actual conversation I had with my then 6 year old son in 1984 in Israel. It was the beginning of the end for us in leaving the chareidi world. Son: "Mommy, does Tati work?" Son: "Oh." (big sigh). "Why does he work?" Me: "So that we have food on the table, and so that you have clothes to wear, and so that we do not have to accept tzedaka from others, and so that we can give tzedaka. And Tati really enjoys his work. Why do you ask?" Son: "My rebbi said that anyone who works is not worthwhile." (In Hebrew it was, "kol mi'she'oved lo shaveh." Imagine, a rebbi has told his student indirectly but in no uncertain terms that the student's father is "lo shaveh" - worthless! We took our son out of the cheder the very next day. He ended up going to a more "modern" school much to the dismay of our neighbors, who threatened that if he attended such a school he would turn out "off the derech" and irreligious and probably married to a non-Jewish woman! Fast forward . . . our children are ALL shomrei mitzvos . . . ALL working in service professions and contributing to society . . . and ALL their children are also shomrei mitzvos in Jewish schools. My kids are across the full spectrum of shomrei mitzvos (yeshivish to modern) because I was makpid to educate them "l'fi darkam" and not according to outside pressure. The real question one must ask about various issues is, "is this Toras emes or is this frum shtick?" If it's the latter, run far, far away! And be true to yourself, because otherwise you are not only cheating yourself, you are cheating the foundation of the values in your home that you wish to transmit to your entire family. Most people in the chareidi community were born into it, and every single aspect of chareidi community's strictures and mores are designed to make it as difficult as possible to leave. How can you say such a thing?? Obviously, it's harder for some people than for others. My point was that communities have a right to choose norms for themselves. The charedi community has chosen to shelter itself from modernity and scholarship. Galia - your story is staggering! I took my son to a faher this week. I asked the principal about the English department, and he said the following alarming statements. 1. "I don't really know about the English department, that's for the English principal." I think if you are interviewing kids and speaking to parents for your school, know about your program. 2. "I do know there are some trouble makers, like everywhere.But only during English". 3. Most of our Talmidim go on to Kollel full time. 4. The SAT's are not presented to the students unless asked for, and then we discourage it. My follow up question was simply, "have you heard of the tuition crisis?". He said yes. I asked where the yeshiva would get money from if not establishing alumni who could provide. You'd think I'd have grown a second head the way he looked at me. I went on to explain that even to write Torah thoughts, you need to be able to write above a 5th grade level. He said, and I kid you not, "Like Artscroll?" I kindly pointed out the most Artscroll books are written at s 5th grade level. Not to detract from them, but they need to appeal to easy reading for the masses. I also pointed out that a great deal of their editing is done by girls, who get a better education. I asked if he had a written Torah thought, if he would want seminary girls editing his work. He said "The Rosh Yeshiva writes beautifully". Oy. Last and unrelated, I wish you would have had more werewolf posts last week. I love bringing a printout yo shul and watching assorted reactions! No matter the field, the "greatest of the great", never go through the same school system that everybody else goes through. The "greats", be they in science, literature, technology, or Rabbis are always found to have "dropped out", or done independent study at some crucial point in their life. There is a very simple reason for this. Anybody who learns everything they do from inside the education system will have the same education as the person next to them. You can ask graduate A or graduate B the same question, and in general you will receive the same answer. Only someone who gets educated "outside the system" in some way is able to come up with a novel answer that other people can recognize as being outstanding, novel, or revolutionary and thus achieve the status of "gadol". Regarding teaching the children to not get a job, it seems to me from the latest reports that despite their education Haredim are getting training and jobs. You should speak as strongly against the academic community which views working with as much disdain. Eh? Academics ARE working - teaching and writing. And they certainly educate their kids to work. (Re-posted from Facebook on Rabbi Eliyahu Fink's comments) Daniel: I just finished reading "Not for the reason you might suspect" as well as all the linked posts about Kollel. I wasn't surprised by Rabbi Slifkin's perspective, I have drawn on as well as argued similarly rational points. However, as someone who has several people in his family and extended family who buy into the kollel and chareidi lifestyle, I have debated endlessly about this and I have some conclusions to share. The primary argument (and I believe it to be utterly paradoxical at best, and fallacious at worst) that is used to justify "learning" is not that it is ersatz working (and therefore subject the the logical criticism that it is an unsustainable drain on resources and creates inefficiencies in society and the economy); but rather that it is the foundation upon which all other pursuits succeed. As an example, they argue that to force them into the army would do unmitigated harm to the effort, as they are already doing their part to help the country succeed, their learning makes them partners in any military campaign. Same for those that are working; the kollel community feels that the reason that you have succeeded in amassing financial resources is that their learning contributed greatly to your success. To sum up, the overall belief is that the act of learning has magical powers, and that to ask them to stop is detrimental to the world! The irony is that this breeds a paradox of phenomenal contempt and derision for those that choose to work, because "success was not attained at their hand" but was merely allocated to them by Hashem as well as a sense of entitlement to the working persons income and assets. I'm curious about your thoughts Eliyahu Fink and would be interested in Rabbi Slifkin's as well should he choose to chime in. See my post about how they don't really believe that learning Torah protects. As for the claim that it brings financial rewards - it's strange that it brings those rewards to those who do less learning and more college! good point, however, I wouldnt school Torah study into the same catagory as the others, since in reality post High School and perhaps maybe a year or two in Israel, everyone in Kollel really is on their own. Lakewood is just a series of buildings filled with 5,000 people studying with little to know direction. That is of course by design, but never the less, those that are worthy should excel in that setting, and yet nobody has. That is why I am suggesting the handicap is due to other factors. Rabbi Slifkin- Tzafnas Paneach was saying and in my experience is true...is that Secular Academics although champion "Work," in the marxist sense deride "profit." They see work as a virtue but us an end unto itself and for that reason often advocate for research and grants to fund research that has little to no practical value or benefit. At the same time your earlier comment still rings true, that even if the academician is not engaging in practical research to benefit humanity, it ends with them and often does not become trans-generational. By way of example, I have a relationship with a former work colleague who's father is a theoretical physicist and mother a regional poet laureate. Like the Charedim with a wayward child, they disagree ideologically in that she advocates for profit based enterprise and the profit motive; they vehemently don't...However, unlike the Charedim, because they are academics, they insisted on her being educated and to pursue a field she could be happy in, which of course gave her the tools to succeed in those or any other field of interest. Ironically, being able to lead a proficient life within an ideology antithetical to her parents belief's allowed them to maintain a strong familial bond, because their difference allowed for spirited dinner conversation not full alienation. seeker - that same rationale can be applied much more broadly. If you ask whether it makes sense to support a smart, capable young man who chooses to learn all day over someone with a chronic disease who can't support his family (or a widow/orphan that the Torah specifically commands us to care for), you also need to ask whether it makes sense to support an upper-middle class family making $125,000 to send their children to private religious school instead of supporting that widow/orphan. You can even take it a step further: does it make sense to spend a fortune sending my own children to day school when I could be teaching them Torah at home and supporting that widow/orphan? Of course, if you did that, you might be fulfilling a mitzvah d'oraitah, but you wouldn't be frum. The attempt to separate the issue of thought control in the Hareidi world from moral and ethical issues appears to be artificial. While a broad-minded view of the book bans may reflect the good character of its victim, it does not validate it. If thought control is bad, then so must book-banning. While it is true that some may come to reject all religious beliefs due to theological or sociological issues. Such issues, however, cannot be forever buried - even in a very ghettoized environment. Attempts at shielding adherents from critical or alternative perspectives, will likely only delay such questioning. The ease of communications in the modern world and the access to ideas is such that ideological isolation is impractical. The percieved moral and ethical failures of the leaders of such frum ghettos can only accelerate this process. Moreover, the idea that married men, as a whole, should be engaged full-time in talmud study is wrong on both a theological, practical, and ethical level. It treats the wife as an employee rather than an equal partner. The fact that many women seen to accept this secondary role willingly is largely a matter of being wrongly educated to believe that this is divinely ordained. Thus, thought-control and unethical behavior are intimately connected. Furthermore, the idea that all questions, including issues of abuse, must be brought first to rabbinic figures despite their lack of training in such matters is both irrational and leads to the perpetuation of abuse. The abuse is compounded when said figures appear to be more interested in preserving the status quo and their institutions then in providing compassion and justice for the victims. In sum, I agree with HaDarda'i that irrationality and sociological/ethical/moral issues can't be isolated. The former will tend to produce problems in the latter. The most chilling aspect of the problem is that Hareidi education emphasizes conformity of thought as well as in appearance and behavior. The problems of poverty and abuse can then only grow. Of course, this can't continue for long, but many will suffer until a great sociological change occurs in the frum world. Can someone please explain how a cheder Rebbe draws a paycheck for working yet derides working as part of the hashkafa he gives over to the kids - and he isn't called a hypocrite? Baruch Hashem, Melbourne, Australia is a very giving community. We get our fair stream of schnorrers. It's a long trek. Av is usually a popular months because they can get cool weather for Tisha B'Av and a "shorter" fast. I give everyone who comes to my door, except the low lives who court Ahmadinajad and the like. I should take the time to hear their story, but I just don't have the time. What I do, now, however, is I ask each of them if they work. What is their profession? What can they do to stop being in the horribly demeaning position of having to stand at someones door step with an outstretched hand. I encourage them to get their kids educated, find a profession, and break out of this vicious cycle. I am under no illusion that most of my words land on deaf ears. That being said, I think it might even be a Mitzvah of Lo Saamod, to at least try and encourage them to get out of the cess pool and emerge with some dignity. Azigra writes: In 50+ years of kollel in this country, [there are] more people learning Torah full time then perhaps any other time in recorded history and there are no "Gedolim" in the United States. That's because there never was any such thing as a "Godol." It was a concept invented for its time. When the European remnant came over to America, speaking a strange langauge, from a destroyed planet, with exotic clothing - they were literally Supermen, particularly to the naive generation of impresionable young men in post WWII America. The young American, Rabbi Moshe Sherer, was able to build up the mythology among the masses of orthodox Jews, and it worked - all the while that generation was still alive. As it slowly died out, the mythology died with it. It's easy to believe tales and stories of pre-war Europe, when there's no one around to contradict it. Not so easy when you're working with people who went to the same schools you did, and grew up in the same neighborhood. There are some exceptions, naturally, and there will always be people willing to believe anything the Charedi press tells them. [There are men on the Moetzes Gedolei Hatorah who have never published a word of scholarship in their lives, and who sit on that body purely because they are the son in law of the son in law of someone who started a yeshivah, and yet - miraculously - they are "Gedolim."] But by and large what I'm saying is true. That is why you dont see any Gedolim today, despite 65 + years of learning. Because there never were any to begin with. Sell short on the Gedolim card manufacturers. DF: But there *were*, and are, greats. ameteur: Come on, that's not true. All the great scientists have the same education as everyone else, degrees from major universities, etc. "My point was that communities have a right to choose norms for themselves. The charedi community has chosen to shelter itself from modernity and scholarship." R' Slifkin, I really don't think you can speak of "communities" "choosing," especially here. No "community" is deciding anything; some self-appointed "gedolim" and their enablers are setting policy for unwilling and unknowing masses. Why not label all the problems you see in each sect "crazy?" You of all people know that each sect cites from Talmud or another Jewish text why they do their crazy things. So what is the difference? For you the question should be rhetorical. The answer is in objective data. What does the objective data tell us? As an emample, "The Challenge of Creation," sets forth objective data, which is accepted by those that have eyes (a will) to see but is rejected, ignored, or denied by all others. It is simple discreet mathematical logic. But would you allow objective data to challenge all areas of Jewish life? To DF: Never been "gedolim" in the US? Hmmm, let's see: Rav Moshe Feinstein, Rav Yosef Eliyahu Henkin, Rav Dovid Lifshitz, Rav Mordechai Gifter, Rav Menahem Schneerson (the late Rebbe of Chabad), Rav Yekutiel Yehudah Halberstam (the late Rebbe of Klausenberg), Rav Levi Yitzchak Horowitz (the late Bostoner Rebbe)Rav Aharon Kotler & Rav Shneur Kotler. And yes - Rav Yosef Dov Solovetchik. Now what were you saying about there never having been "gedlolim" in the United States? "good point, however, I wouldnt school Torah study into the same catagory as the others, since in reality post High School and perhaps maybe a year or two in Israel, everyone in Kollel really is on their own. " I've never been to kollel myself, but from what I've been told, there is a strong pressure to stop learning the Talmud on your own and to instead start "towing the party line" uncritically from whichever book the Kollel you are learning in believes to be the latest "final say" on some issue. My own yeshiva experience was dissilusioning when I found a room full of people uninterested in the ramifications of the words of the Talmud. I can't imagine that Kollels are set up in such a way that people have the social circles to develop new ideas in. I'm sure the first new bright idea thought of in a kollel is immediately shot down by piers as being "unsourced" or "that isn't how we pasken", and thus no "new research" can come out of them. I have a few criticisms of the Hareidi lifestyle, but I will just expand on Natan's issue here of the deliberate creation and maintenance of poverty. 1. By pressuring families to live off government grants of one form or another, the Askanim have made the hareidi community dependent upon those Askanim. This is typical of dictatorships all around the world: "keep them poor, ignorant and dependent." 2. The Hareidi person who is used to receiving but not giving fits the model of the Spilt Child that has been researched by psychologists in the past decade or so. They expect to receive money, rights, security, sidewalks, parks, etc. And yet they show complete disdain adn even antagonism towards those who provide for them. This is part ofteh imapried edvelopment of a person (or community) that ha no obligations. Teh child whose parents give them everythign and ask nothign in return, does not respect his parents. he hates tehm. Such si hapening here in Isreal. If teh Hareidi community were truly partners with non-Hareid people, they woudl honour teh martyred soldiers on Yom Hazikaron, thank HaShem for all we have on Yom HaAtzmaut and Yom Yerushalaim, fly the Israeli flag over their yeshivot (As was once done at Ponovitz), daven for the welfare of our soldiers, and generally make an effort to keep their neighbourhoods clean, make no demands that their lifestyle be enforced on anyone else (especially not on public buses) and be grateful for the government funded schools, shuls and mikvaot that they receive. When a child is spoilt, he hates his parents without understanding the reason why. Thai is what is happening with the Hareidi community in Eretz Yisrael, even among those who do work under the table). Re David Meir - It is a tragedy that so many anglos feel so detached from the dati-leumi world. My brothers' teachers in a certain Yeshiva high school taught that a kiap seruga means "not frum" , and that message has been swallowed and accepted by too many north american Jews. Ämeteur: "I've never been to kollel myself, but from what I've been told, there is a strong pressure to stop learning the Talmud on your own and to instead start "towing the party line" uncritically from whichever book the Kollel you are learning in believes to be the latest "final say" on some issue." This is incorrect. If there are 5000 people in Lakeweood at the moment then there are about 3,000 different topics being studied. Kollel is not like University with textbooks, you can join whichever group or kollel is studying the topic you want. ie some choose shabbos laws, others just want to study talmud etc..
Alan Schleider: And where was every one of those people trained? That's right, Europe. There *are* American gedolim, but they've pretty much all gone to (and are still at) YU and are thus not considered "gedolim." I believe Ami published an interview with the prosecutor the week before they published one with the defense attorney. From where I am sitting, they are trying to be evenhanded and impartial. No, it was with the DA. I haven't seen all of it, but the parts I saw were not about Weberman, and the types of questions were not parallel to the questions to the defense lawyer. In addition, I don't think that "an impartial approach" is called for when he was found guilty on 59 counts! The obvious conclusion is that he was guilty! What does Ami have to say about men counseling girls in a room that is locked from the inside and has a bed in it? Or taking them for 14 hour drives? This problem can be summarized in two words - Bais Yakov. If girl schools wouldn't indoctrinate their students with the wonderful virtues [sic] of being married to a kollel man the whole system would fall apart. What girl in her right mind would "sign up" voluntarily to a life of child rearing, cooking, cleaning AND earning a living with no prospect of advancement?! Its no accident that there is a direct correlation between the rise of Bais Yakov schools and kollels. Bais Yakov producing girls desiring kollel men sets the whole system into motion. Young boys take notice and naturally want to marry the best girls, who are now kollel seekers, this influences a young man Yeshiva choice. If they aren't really kollel material, they at least want to be associated with that demographic - so they apply to a Yeshiva which preaches Kollel virtues. Once in yeshiva they future is unfortunately set, they either are brainwashed and become kollel men or worse yet the aren't kollel material but leave Yeshiva with zero skills. Bais Yakov schools must change their curriculum. they need to advance independence while preaching the virtues of a well rounded man - THAT should be the ideal. Is this Irrationlist Judaism? Ami interviewed the prosecutor (i.e. DA Hynes) a week before. His statement that the charedi world must report molestation to the civil authorities was agreed to by Ami. (BTW the defense attorney said the same thing in his interview.) No charedi publication has even touched this before. That Ami wouldn't publish the details of the abuse is out of tznius not because of a cover up. You are correct that living in RBS makes one more sensitive to the "herd mentality" that has overtaken a large portion of the community. It is frustrating to see otherwise intelligent and understanding people follow a dangerous path only to achieve the feeling of "belonging". They don't see what they are doing to their children by placing them in such schools and then later bemoan the fact that their kids are falling "off the derech". Mention Rappaport as a viable option and they recoil in horror. 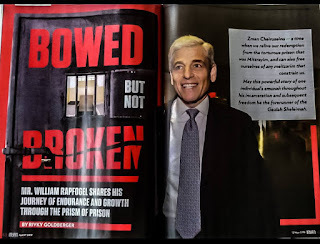 They have been told that Rappaport is a den of iniquity that will taint their family. I have spoken to numerous people who are interested in other options yet fear the repercussions of "chanoch l'naar al pi darko". I truly hope and pray that they come to grips with their insecurities and put the welfare of their families above all. So, you can safely conclude that the ban, while it may have exacerbated things, was not the reason for your break. It was inevitable. Indeed, none of the readers on this site (among countless others) have had their books banned, and yet also do not believe in charedeism. You can be a thinker and be honest and be charedi, but you cannot be all three at once. Chaim Stan - Good point re: Beis Yaakov. It does take two to tango after all! DF said: "You can be a thinker and be honest and be charedi, but you cannot be all three at once." I believe Rav Steinsaltz fulfills all three requirements at once--unless people want to exclude him from being considered charedi. Why on earth would he be considered charedi? David Meir makes a good point. A cultural difference separates MO from charedism in the USA and Israel -- not just an intellectual one. Most of my beliefs are MO, but culturally, I feel more at home in an old wooden charedi shul than I do in a fancy, flurescent MO one. Rabbi Slifkin wrote: "Why on earth would[Rav Steinsaltz] be considered charedi?" Well, besides the chassidic garb, on Shabbos at least, he also has devoted a lot of time and energy to chassidic and kabbalistic texts--not just in a detached, scholastic way, but to really try to internalize what these texts say. Rav Steinsaltz would go even further and say that someone who doesn't internalize these teachings doesn't deserve the name "chassid". I thinks that's how Rabbi Steinsaltz defines himself. I think the question we need to ask ourselves is: "Who is a Chareidi"? Is there a credo? Does the person decide? Does Chareidi society decide? Does non-Chareidi society decide? He's not charedi. It doesn't matter how he dresses, and it certainly doesn't matter how he describes himself. I can call myself a Frenchman, but it doesn't make me one. See my paper "The Evolution of Haredim." Now let's get back to the topic of my post. Shalom R. Natan, your writing hits the target. However, living in Ba'al Teshuva hareidi - America, I must say that despite the Ba'al Teshuva "how high" gullibility that ironically drives FFB chareidim crazy, these ba'alei teshuva never seem to stomach the concept of Kolel. They can be pronouncing Da'as Torah one second as a "שקולה כנגד כל התורה כולה" but feel comfortable bashing Kollel like one of the 'Treifeh Madernishers'. My point is that as the Baal Teshuva movement grows, poverty unfortunately rises, and the Haredi defection rate rises abysmally, the Kollel thing may become the next Neturei Karta! What do YOU think? And thus the straw man is erected . . .
Natan Slifkin, are you saying that self-described chareidim are not really chareidi, if they are "normal people"? If that is the case, then at least 80% of the yungerleit in BMG that sit all around me in the bais medrash are not chareidi. Maybe that is the case. So how should we label the vast majority of "ultra"-orthodox, black hat wearing, "Godol" respecting jews who, as it turns out, are not actually chareidi? Where did I say anything about "self-described chareidim are not really chareidi, if they are normal people"?! All I said was that describing oneself as charedi does not necessarily mean that one is charedi. Problem is, your definition of chareidi is as arbitrary as the next person's. I'm glad I don't live in Israel, at least in the parts like RBS where apparently you must be labeled and identified before there will be any social acceptance from anyone. The Charedi establishment rejected and ostracized Rabbi Steinsaltz. He is charedi in the literal "God fearing" sense of the term, but that is not what we are talking about when we speak about "charedim" as a societal population. In the sociological sense of the term he is obviously not. And just ask any rabbi their opinioon about him and they'll give you some canned line about him not having a rebbe or defying daas Torah. Pretty easy to guage whether a famous personality like this is within the charedi "fold." Btw I get those ridiculous canned one-liners even from rabbis who teach baalei teshuvah and are generally open minded about many things. There is a readiness to accept party line and bash Rav Steinsaltz almost like no other, throughout the entire charedi world. I don't donw how you define chareidi, but it is clear from your comments that a chareidi can not be both honest and thinking. Since, in my experience, most Jews who get a draft deferment on religious grounds can be both honest and thinking, what should we label them? Chareidi, I suppose. And then, when any one particular member of that group is shown to be able to be an honest thinker, you will say that that person is not actually a chareidi, or they are an anomaly. You have yet to explain why thousands of level headed intellectual and rational American businessmen support the kollel system worldwide by pouring in millions of bucks to keep it going. Yankee, plenty of people in the charedi world are only charedi from a social standpoint. Warren, I will answer your question in the next post. if you want an example of the "best of the best" whose education was via the established schools, you can take the late Richard Feynman (for whom I once TA'd). By personality, he was way out there, but his schooling was entirely conventional. (Although his approach to teaching often wasn't.) Also think of how many hall-of-fame football players went to top tier football schools. I think you dramatically overstate your case. The real problem I have with the "Torah learning protects" view, aside from its convenience and hypocrisy, is that it utterly denigrates the Torah learning of those who work, serve in the Army, actively raise their kids or contribute directly to society. "Also think of how many hall-of-fame football players went to top tier football schools. I think you dramatically overstate your case." You have cause and effect backwards there. The best are good before they get their football scholarship to the name brand schools. As for Richard Feynman, his wikipedia article says that he taught himself, and did not use that standard methods of his day. "In the year 1933, in which he turned 15, he taught himself trigonometry, advanced algebra, infinite series, analytic geometry, and both differential and integral calculus. Before entering college, he was experimenting with and re-creating mathematical topics, such as the half-derivative, using his own notation. In high school, he was developing the mathematical intuition behind his Taylor series of mathematical operators."